Species Spotlight - Hen Harrier. Point of Ayr Voluntary Wardens wanted. 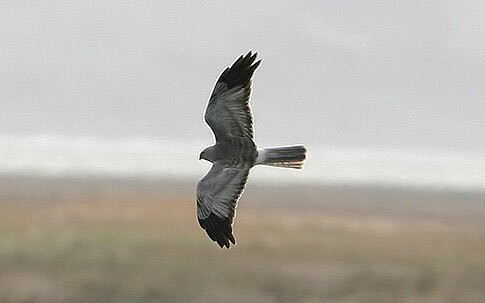 Adult male Hen Harrier at Parkgate, March 14th 2009, © Steve Seal. A winter visit to the marshes off Burton, Parkgate or Heswall will normally be rewarded with a view of a Hen Harrier or two. Often views can be somewhat distant as the birds are usually out towards the edge, but sometimes the birds come much closer and you can get great views of these fabulous raptors. When I think of Hen Harriers two particularly close encounters I've had spring to mind. One was a ring-tail Hen Harrier off Heswall. It was quartering the marsh off Target Road slowly making it's way towards me and Heswall Gutter. As it approached the Gutter a flock of Redshank flew by - in a flash the Harrier side slipped and took one of the Redshank in mid-air. It happened so quickly I hardly realised what had happened until I saw the bird go down onto the ground to eat the Redshank. I was amazed at this as I didn't know Hen Harriers were capable of catching birds like this, the usual way of hunting birds is to surprise them on the ground whilst flying low over the marsh. Having seen several Redshank evade capture by Peregrines, often diving into the water, I was surprised at how easily this one had been caught. My other close encounter was when I was at Denhall Quay watching Short-eared Owls. Suddenly I realised over to my right was a full adult male heading towards me. This was the first one I'd seen on the estuary so I was thrilled. I watched it for about five minutes before it turned towards me getting ever closer until in the end it flew right in front of me just five yards away. A fantastic view of this most elegant of birds - it's grey plumage shining in the sun! Apart from the occasional good fortune as detailed above the best place and time to see Hen Harriers is off the Old Baths car park, Parkgate, where the birds roost. They come into the roost over quite a long period of time so it is best to get there a good half hour before sun set, another thing to be aware of is that birds can slip away from the roost unseen only to reappear and be counted again! If it's windy expect a spectacular view as the birds seem to love flying in the wind, often they will all be in the air together interacting with each other. Last winter was an exceptional one for Hen Harriers on the estuary, no doubt for the same reason as there were loads of Short-eared owls - large numbers of field voles in the marshes. The max number of birds coming into the Parkgate roost was six, the largest count since the winter of 1990/91, when six were also counted. The highest count in modern times was seven in the winter of 1980/81. The last 14 months have also been unusual as birds have been present continuously on the estuary from Aug 2008 to Sep 2009. Over-wintering birds have usually left the estuary by the end of March although birds on passage are sometimes seen until early May, and the first returning birds are usually spotted in September. This year we appear to have had at least one ringtail present on the marshes right through the summer, and as I write at the end of September 2009, there are two birds present - a male juv and a female. The roost at Parkgate was discovered in the winter of 1979/80, which is when the graph above starts. During the 1970s prior to this numbers of Hen Harriers showed a steady increase from a low point when birds were largely absent for a considerable number of years during persecution in the 19th and early 20th centuries. According to the RSPB website there are currently estimated to be 749 pairs nesting in the UK with another 57 pairs on the Isle of Man. Many of these breed in Wales, Scotland and Northern Ireland where numbers appear to be stable, perhaps even increasing. This is in contrast to England where the species is still persecuted and outside a few protected areas (such as the Forest of Bowland) very few pairs survive. The photograph (left) shows chicks which have been wing tagged - these ones were in the Yorkshire Dales (© Natural England/Stephen Murphy). 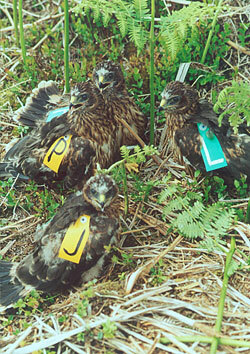 A large number of birds have these tags, particularly those breeding in England. It is surprising that over the years very few of the Hen Harriers visiting the Dee Estuary have been tagged, as you see they are hard to miss! It is likely, therefore, that many of our birds are from the larger population breeding in Scotland and the handful of wing-tagged records support this. Wing-tagged birds marked as nestlings in the Scottish Borders were seen on nearby Frodsham Marsh in 1996 and two were on the Dee Estuary in the winter of 1998/99. 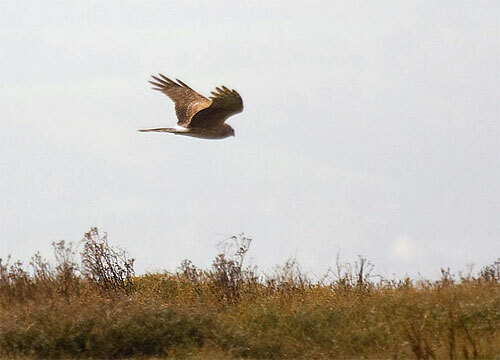 Etheridge & Summers record one female on the Dee Estuary which had been tagged in North Wales during their study into Hen Harrier movements in the 1990s. It is also likely that birds from the thriving population on the Isle of Man visit the Dee Estuary, birds are sometimes observed flying in off the Irish Sea and might well come from here - although there is no direct evidence to confirm this, as far as I'm aware. 1. Personal observations and records sent to me directly, including data published on this website. 2. The Migration Atlas, BTO, 2002. 3. David Norman, Birds in Cheshire and Wirral (Atlas), CAWOS, 2008. 4. Cramp & Simmons, Birds of the Western Palearctic, DVD edition BWPi, 2006. 5. Cheshire and Wirral Bird Reports, CAWOS, 1979 to 2007. 6. Brian Etheridge & Ron Summers, Movements of British Hen Harriers Circus cyaneus outside the breeding season, Ringing & Migration (2006) 23, 6-14. Juvenile Hen Harrier at Inner Marsh Farm RSPB on Sep 29th 2009, © Steve Round. Point of Ayr RSPB Reserve - Voluntary Wardens Wanted! Point of Ayr, on the North Wales coast at Talacre, is a great place to watch a variety of birds as they come in to roost at high tide, but unfortunately the site is extremely vulnerable to human disturbance. The RSPB is looking for extra volunteers to help warden this invaluable roost site, and protect the birds throughout the cold winter months. Shifts are run most weekends and typically last between 3-4 hours, depending on the height of the tide. If you would like to help in any way please contact the RSPB on 0151 336 7681. Not only are you helping to save the planet, but it’s also great birdwatching too! Editor - to get an idea of how good an area this is for birds see the Point of Ayr Site Guide. September is often a very good month for birds but this one was exceptional. The seven days between the 2nd and 8th were astonishing, and the rest of the month wasn't bad! Starting with seabirds over those seven days: 2 Balearic Shearwaters, 1 Sooty Shearwater and 800 Manx Shearwaters off Point of Ayr on the 2nd was a good start. Next we had another Balearic Shearwater off Hilbre the following day, with a possible at New Brighton on the 4th, then another Sooty Shearwater was off Wallasey the same day. Several Sabine's Gulls were seen with two juveniles close in at Leasowe Lighthouse on the 4th and also three at Wallasey. One off New Brighton was an adult. The 5th saw three more Sabine's Gulls including a very obliging juvenile on Hoylake shore. Arctic Skuas were in double figures for three days with a max of 34 at Hilbre on the 5th, other Skuas included 10 Great and both Pomarine and Long-tailed. Perhaps the only disappointment was we only had a few Leach's Petrels with a max of 13 on the 5th, but an experienced birder did have a probable Fea's Petrel off Hoylake - but a bit too far out to be certain. A juvenile Red-necked Phalarope was at Heswall on the 2nd and 3rd. On the 6th a Citrine Wagtail flew over Hilbre then landed, if accepted this will be a first for Cheshire and Wirral. On the 8th a Greenish Warbler was seen briefly but clearly in a garden in Hoylake - the second for Cheshire and Wirral. 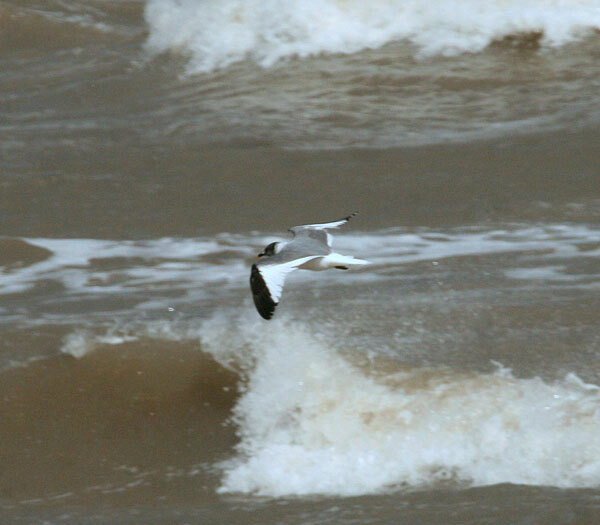 Adult Sabine's Gull, New Brighton, Sep 4th © Colin Jones. The best of the birds for the rest of the month were mainly waders, mostly at Inner Marsh Farm RSPB. A Wood Sandpiper was there for three days from the 9th followed by two Pectoral Sandpiper on the 14th which were there again on the 17th. A Little Stint was on Heswall shore on the same date and a Pectoral Sandpiper on Burton Marsh on the 20th when there was a juv Red-necked Phalarope on Leasowe Shore. Next, a Long-billed Dowitcher turns up at Inner Marsh Farm on the 26th, probably the same one that had been at Marshside RSPB earlier - or so we thought as, remarkably, a second bird arrived the following day and they both stayed for the rest of the month - the ninth record for Cheshire and Wirral. 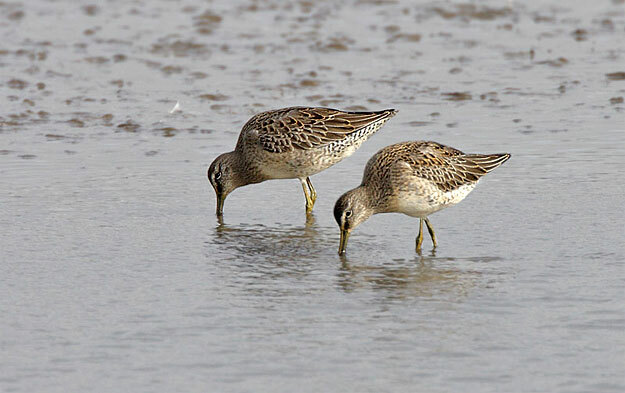 Long-billed Dowitchers at Inner Marsh Farm, Sep 28th © Steve Round. The Mersey Ferry/RSPB Bird cruises had two good birds: a Honey Buzzard which flew from New Brighton to Liverpool on the 14th and yet another Sooty Shearwater out in Liverpool Bay on the 26th. Two notable high counts this month: 247 Great Crested Grebes off Leasowe Lighthouse on the 17th and a remarkable 315 Little Egrets came into roost at Inner Marsh Farm on the 23rd, yet another record high; a Great White Egret was on Warren Farm, Talacre, on the same date. Little Egrets over Inner Marsh Farm, Sep 28th © Steve Round. Many thanks go to Steve Round, James Smith, Mark Evans, Stephen Hinde, David Thompson, Steve Williams, Jeannette Renshaw, Phil Oddy, Paul Vautrinot, Dave Edwards, David Small, Dave Harrington, David Esther, Andy Thomas, Steve Liston, Paul Brady, Stephen Morris, Neil McLaren, Stuart Thomas, Paul Shenton, Fred Wright, David Haigh, Gavin Little, Charles Farnell, Julie Rogers, Jeremy Bradshaw, Jeff Stephens, Bruce Atherton, Joe Trilly, Henry Hill, Toni Plagge, Jon Greep, Kevin Smith, Sean O'Hara, Peter Welch, Steve Seal, Brian Grey, Richard Steel, Chris Butterworth, Dave Wild, Chris Tynan, Mark Murphy, John Roberts, Peter Button, Paul Rutter, Martin Kelly, Tom Giles, Matt Thomas, Mike Davenport, Keith Scovell, Jason Stannage, William Boyce, Kenny Dummingam, the Dee Estuary Wardens and the Hilbre Bird Observatory for their sightings during September. All sightings are gratefully received. 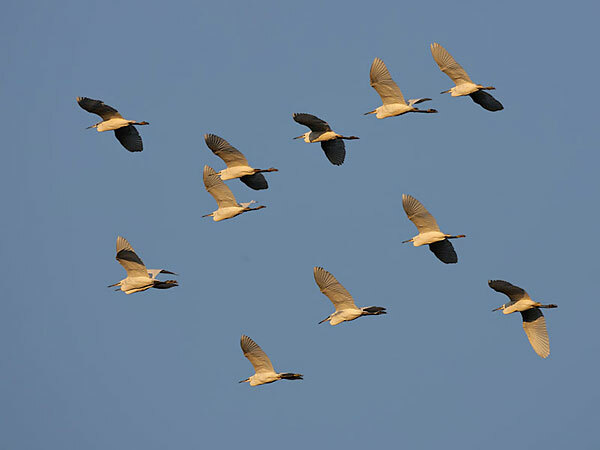 This is the month for Visible Migration - when migrating birds can be seen passing overhead, particularly along the coast line. The best conditions for this is a south-east breeze, overcast with a slight mist, and the best places to see it are Red Rocks, Thurstaston, Denhall Lane (Burton), Hilbre and Point of Ayr. Get there early in the morning as it is usually all over by 10am. If the conditions are right what you will see will be flocks of finches, thrushes and starlings making their way south along the coast line - perhaps one flock of 50-100 birds every few minutes, although on good days the passage can be virtually continuous which was the case in 2007 at Red Rocks - see Oct 2007 Bird News. October 2007 was also a good month for rarities (Radde's Warbler, Blyth's Reed Warbler etc), and these can be blown across to our side of the country on an easterly wind. On the other hand a north-westerly gale or two would be welcome, and it would be an unusual October if we don't get at least one gale. It is not too late to get good numbers of Leach's Petrels as well as Sabine's Gulls, Grey Phalaropes, various skuas etc blown within sight of the coast by the winds. Shelduck on the estuary normally peak in October and Dawpool Bank off Thurstaston at low tide will hold around 8,000 to 10,000 birds, probably more than any other site in the country. Wader numbers will also build up rapidly through the month, particularly if it turns cold. Last year we had large counts of Short-eared Owls on Burton Marsh in October, lets hope it's another good vole year! 18th October, 11.54hrs (BST), 9.6m. 19th October, 12.33hrs (BST), 9.5m. Sunday 4th October, Black-tailed Godwit Spectacular. Large numbers of this fascinating bird gather on the mud banks and marsh off Flint Castle and Oakenholt Marsh at this time of year. Meet at Flint Lifeboat Station car park (next to Flint Castle) where the RSPB warden will meet you to lead a walk down to Oakenholt Marsh. Wellies are a must, this event is free and no need to book. Starts 9.30am. For further details ring 0151 336 7681. Sunday 11th October, The famous Raptor Watches are back! Last year was a record year for numbers of short-eared owls and hen harriers, other raptors included marsh harrier, kestrel, merlin, peregrine, buzzard, sparrowhawk and barn owl! Join RSPB staff and volunteers to find out all about the areas brilliant birds of prey. Meet at the Old Baths Car Park, Parkgate, starts 5pm. For further details ring 0151 336 7681. Note that the two events on Sat 17th October can be easily combined as most birds at Heswall will be seen between 9am and 10am, leaving plenty of time to get to Hoylake for the high tide there. Saturday 17th October, 9am start, Mud’n’Marsh. Join the Rangers down at Banks Rd, Lower Heswall where the mudflats of the Dee meet the marsh for a high tide birdwatch. From our elevated vantage point on the shore we will watch thousands of Shelduck floating off the mudflats as the tide comes in along with many waders which fly up Heswall Gutter and into the safety of the marsh. No need to book, meet at Banks Rd car park, Lower Heswall. This event includes a one mile walk and is likely to be muddy, please use appropriate footwear. Saturday 17th October. 9:30 am start. High Tide BirdWatch at Hoylake. Join the Rangers, the Dee Estuary Voluntary Wardens and the RSPB to see the large numbers of wading birds on Hoylake beach. With a rising tide, we should see the birds at close quarters as they roost and feed. Beginners welcome. Dress warmly and bring binoculars if you have them. (HW 10:51 am @ 9.4m). Meet on the promenade at King's Gap, Hoylake. For further information, contact the Coastal Rangers on 0151 678 5488. Sunday 18th October, 10am – 3pm, Connah’s Quay Reserve Open Day. Join the Deeside Naturalists Society for some spectacular high-tide birdwatching. (HW: 9.6m, 11.54hrs). Location: From A548 take the Connah’s Quay turn, and follow the Power Station signs. A member of the society will greet you at the reserve entrance. Further information: D.N.S. - 01244 537440. Friday 6th November. High tide birdwatch on Hilbre Island. Join the Rangers and staff from the RSPB for a high tide visit to Hilbre Island. Among the usual species of wading birds, we should encounter Purple Sandpipers and also good numbers of Turnstones. (Please note this is a high tide visit to Hilbre and we will be cut off from the mainland). Warm clothing and suitable footwear are essential. There is a £1.50 charge for this event. Sorry no dogs. Please book early as there are limited places available. For further enquiries call: 0151 648 4371/3884. Saturday 14th November - Feed the Birds Day at Ness Botanical Gardens - A cosy little birdwatch by an open fire. Contact Ness Botanic Gardens to book 0151 794 2000. Sunday 15th November - Raptor Watch at the Old Baths Car Park, Parkgate. Last year was a record year for numbers of short-eared owls and hen harriers, other raptors included marsh harrier, kestrel, merlin, peregrine, buzzard, sparrowhawk and barn owl! Join RSPB staff and volunteers to find out all about the areas brilliant birds of prey. Meet at the Old Baths Car Park, Parkgate, starts 3pm. For further details ring 0151 336 7681.